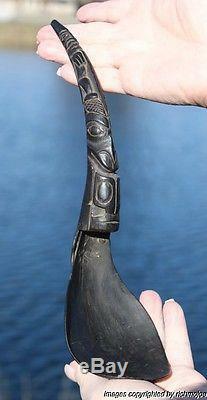 A rare fine old Northwest Coast Haida or Tlingit Indian 19th Century hand carved figural two piece ceremonial mountain goat horn feast spoon. The spoon is made in the traditional old way , carved from a two pieces of mountain goat horn and fastened together with copper rivets. 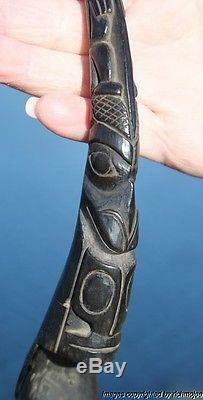 Note the beautiful detailed imagery on the handle featuring killer whale and a man holding onto the dorsal fin. The imagery is a depcition relating to the Haida myth of Gunrah and the whale, and would have been owned by a member of the chiefly family who had rights to depcit this myth. Very finely carved and graceful proportions. The spoon measures a respectable 10 1/2" L x 2 3/4" across the bowl and is in very good condition. It comes with a museum type metal display stand. 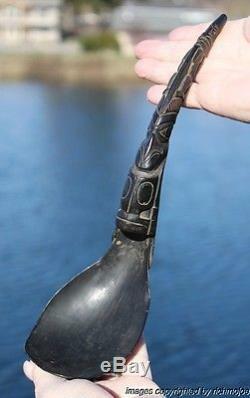 This type of spoon was used ethnographically in ceremonial feasts to spoon fish and seal oils. Often passed down from generation to generation they were prized family possessions. The spoon makes a great display item and a fine addition to anyone's collection. Please check out other current offerings including a great Tlingit, Haida, Tsimshian and Kwakiutl totem poles, many historic baskets d e- accessioned from museum collections including Salish, Haida , Tsimshian , Cowlitz and Tlingit examples. Also some great early Inuit carvings. More than just a pretty picture. FREE scheduling, supersized images and templates. Over 100,000,000 served. Get FREE counters from Vendio today! 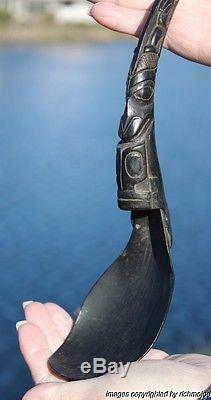 The item "FINE OLD NORTHWEST COAST HAIDA OR TLINGIT MOUNTAIN GOAT HORN FEAST SPOON 19thC" is in sale since Monday, March 07, 2016. 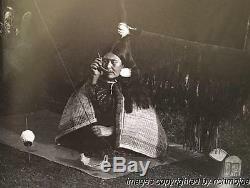 This item is in the category "Collectibles\Cultures & Ethnicities\Canada\ Aboriginal".